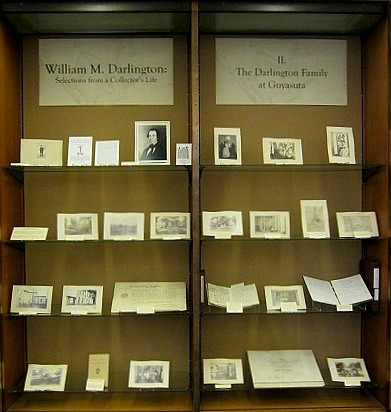 This library guide is an overview of the Special Collection's exhibit, "William M. Darlington: Selections from a Collector's Life," which features items that were a part of Mr. Darlington's early American history collection. O'Hara affectionately called his estate Guyasuta, in honor of his friend the Seneca Indian Chief Guyasuta. Guyasuta was a guide and hunter for George Washington in 1753 when the future U.S. president was in charge of delivering a letter to the French at Fort LeBoeuf, near present-day Erie, Pennsylvania. Guyasuta later took sides with the French, fighting in the French and Indian War against the British. Guyasuta originally owned the land that James O’Hara purchased from the Army in 1793.